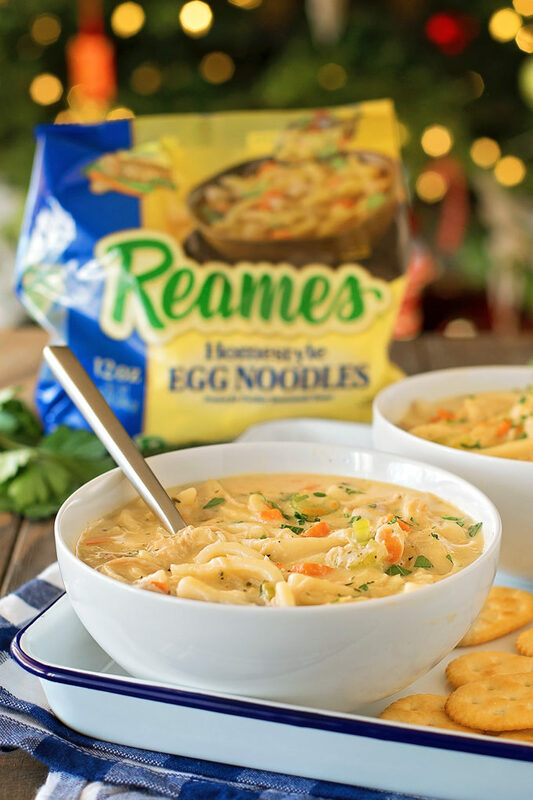 I’m partnering with Reames® Frozen Egg Noodles to bring you today’s recipe. All opinions are my own. Thank you for helping me work with companies I love! 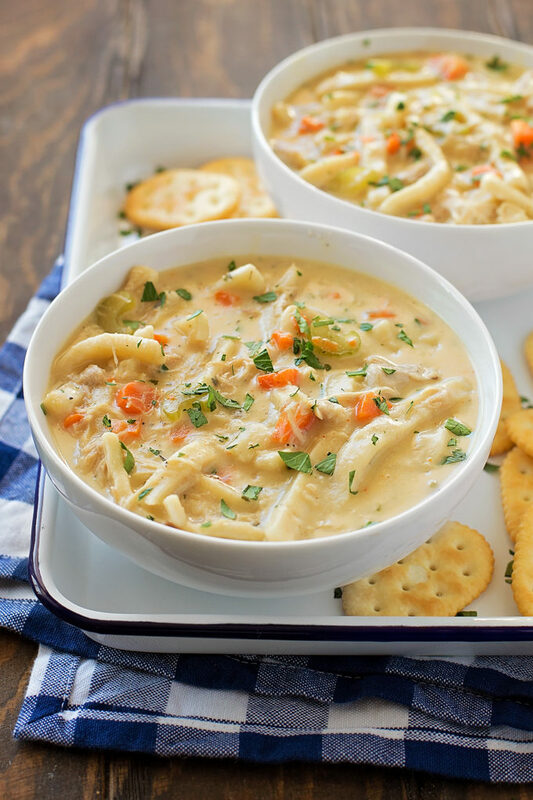 This thick and creamy chicken noodle soup is the perfect cozy meal for a cold winter day! It’s simple, delicious and filling. With Christmas right around the corner, we’ve been busy preparing for holiday parties, cookie exchanges, and making the big day magical for our kiddos. Life is busy, it always is, which means dinner is often an afterthought or a rushed meal. We’ve been trying really hard to resist the urge to eat out and instead, make a simple meal that gets all of us around the dinner table. Soup has been my go-to. The kids will eat it, leftovers are enjoyed for days, and I can always sneak in lots of veggies. 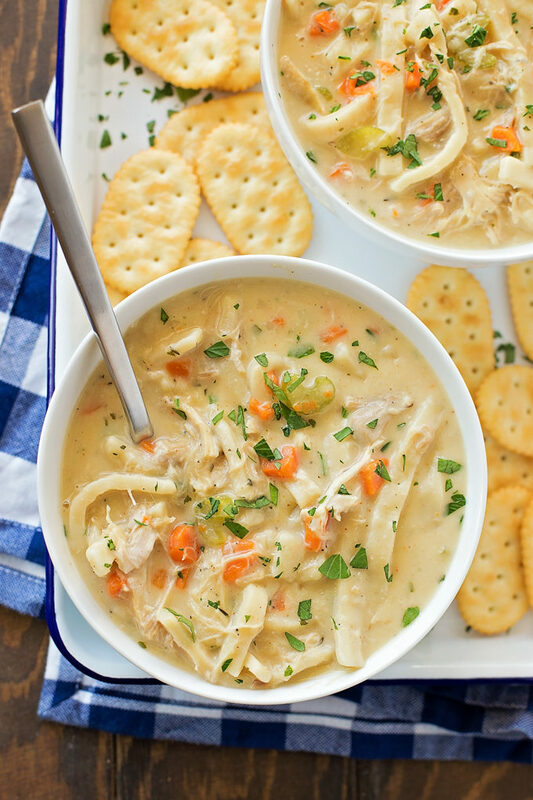 Today I’m sharing a twist on a classic: creamy chicken noodle soup. I made this soup a few weeks ago and our four year old insisted we make it again, so I did! It’s hearty without being overly rich, full of veggies and protein, and loaded with thick, homestyle egg noodles. What’s not to love? We’re no strangers to chicken and noodles or chicken noodle soup. My kids love it when I use homemade egg noodles, but like I mentioned above, I just don’t have the time during the holidays. That’s where Reames Frozen Egg Noodles save the day! They’re hearty with a thick, chewy taste and texture. Totally superior to the thin, dried egg noodles you find on the shelves at the grocery store. 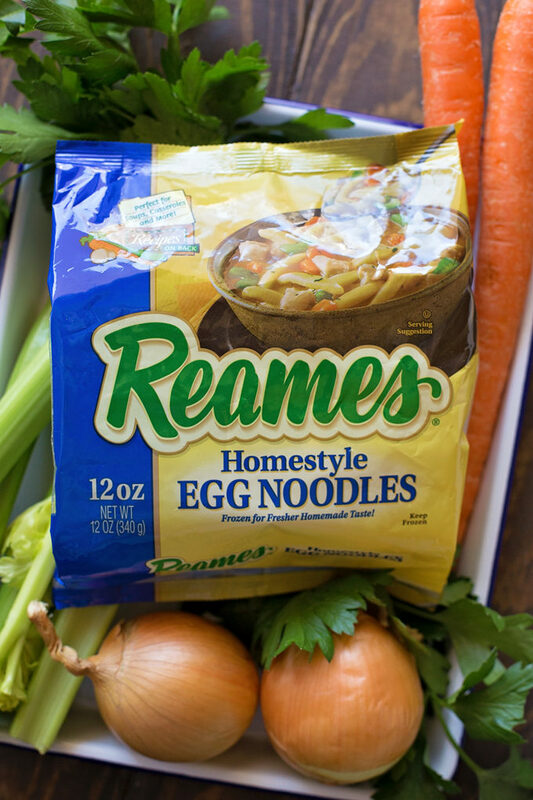 Reames uses three simple, natural ingredients: eggs, flour and water. Just like you’d make from scratch, only these noodles get frozen for freshness. You’ll need to grab a 12 ounce bag of homestyle egg noodles for this recipe. As soon as the broth is boiling, toss them in and let them go until they’re nice and tender. Everything comes together in just under 45 minutes, especially if you use rotisserie chicken or a pressure cooker (on the side) to cook the chicken. This recipe is great for those times when you need to make dinner in a hurry, or when you need a warm bowl of comfort after a long chaotic day. If you want to bulk it up a bit, you can always add more veggies. Corn, peas and mushrooms are all great options! Or keep it simple and classic by adding extra carrots, celery and onion. You can’t go wrong! 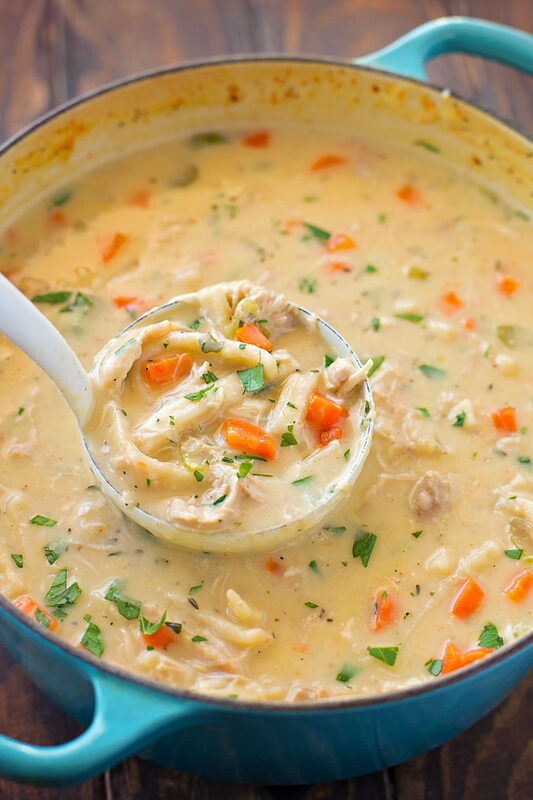 If you love chicken noodle soup, you’ll love this creamy, hearty version! It’s comfort food at its finest. 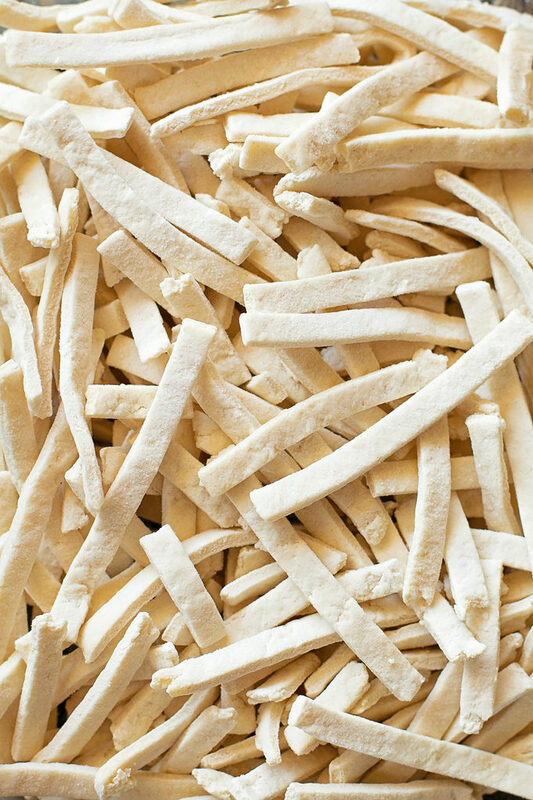 See the real difference between dry and frozen noodles HERE! Make sure to check out Reames on Facebook for delicious recipes and more! GIVEAWAY! ENTER TO WIN A $50 VISA CARD!! HOW TO ENTER: Share your favorite soup in the comments section below. I’ll pick a winner on 12/22/17. No PO Boxes, open to US Residents only. In a large stock pot or Dutch oven set over medium heat, melt 1 tablespoon of butter. Add carrots, celery and onion, saute until tender, about 5 minutes. Pour in broth and water, bring mixture to a boil. Add seasonings, then the egg noodles. Boil for 15 minutes. Meanwhile, in a medium skillet set over medium heat, add 3 tablespoons of butter. Whisk in flour and cook, whisking constantly for 1-2 minutes or until it turns a pale golden brown. Slowly pour in the milk and cream, whisking until a smooth paste forms. Carefully whisk mixture into the large pot. Add shredded chicken and continue cooking for 5 minutes. Remove from heat once egg noodles are tender. Sprinkle with freshly chopped parsley, if desired. – You can swap out frozen egg noodles for 12 oz. of your favorite pasta. Reduce cook time by 10 minutes. – Corn, peas and mushrooms all make great additions to this soup. 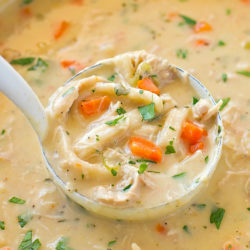 My favorite soup is Creamy Chicken and Wild Rice Soup. Sooooo yummy!!! 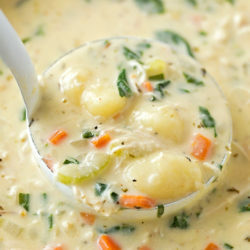 My favorite soup is New England Clam Chowder. Had it for dinner tonight. This look amazing!!! I am definitely going to be trying this! My favorite soup so far, since I haven’t tried this, is a cheeseburger soup. It is hearty and makes a delicious meal, especially with a warm artisan bread to dunk in it! hey girl- this looks so good! Chicken Wild Rice is my favorite! New England Clam Chowder in a bread bowl! I LOVE carrot ginger soup!!! 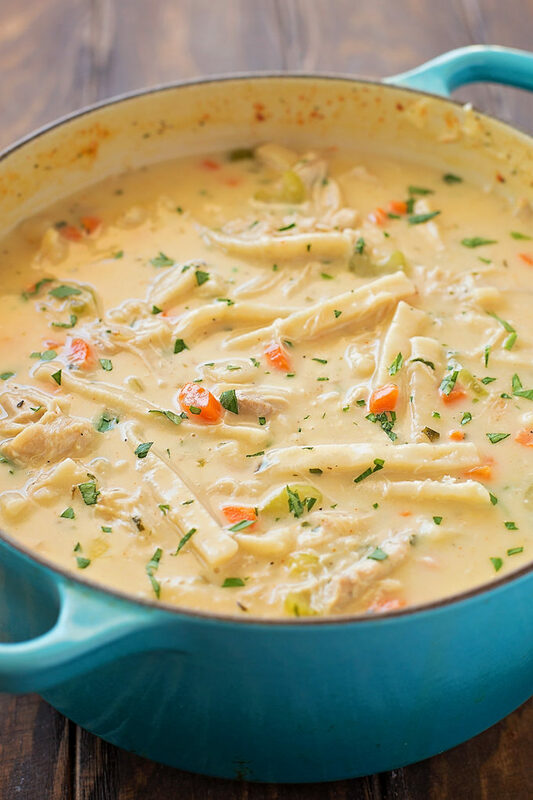 My favorite soup recipe is my grandma’s chicken soup with dill and sour cream dumplings! My favorite is my dad’s homemade andouille sausage gumbo. My absolute favorite is french onion soup. I love spicy chicken tortilla soup. My favorite is chicken noodle soup. This looks fantastic. I will be making it Friday night, after a full day of baking, sewing and gift wrap, so this filling and quick recipe is perfect. Thank you so much for another great year of inspiration and recipes! My sister and I make it also but it is missing something,just not the same,but good.Thank you for recipe of what I will be making for our anniverssary dinner tonight as we are both under the weather.Just want a little change. Happy Holidays to all!! Made this tonight with a rotisserie chicken (basically the entire bird), and used 3/4 c. heavy cream and 3/4 c. 2% milk since I didn’t have whole milk. Otherwise didn’t deviate from recipe, and in the end needed a lot more salt than called for. I think next time I’ll forego the low sodium chicken broth and just use regular. Otherwise turned out great. I made this a couple of weeks ago but I had never made noodles before and mine were not the best. However, the soup recipe was awesome! 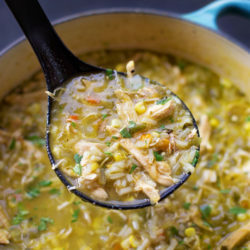 The only change I made to the recipe was I added 3 heaping tsp’s of Chicken Better Than Bouillon. I know….that’s cheating, but it tasted really good! lol I also used homemade chicken stock. Made it for dinner! 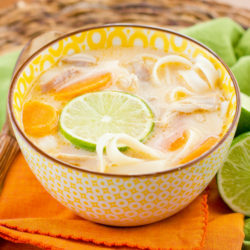 Everyone loves it, used regular chicken broth instead of low sodium ( store was sold out) still delicious!! This is such a hit. I am asked to make this for every family gathering and my hubby always asks for it any day of the week. I love adding white wine while sweating the veggies. Adds a little umph. Still perfect as is though!! !